Today’s entry is written by Alexsandra Mitchell, an adjunct librarian working in the Tamiment Library and Wagner Labor Archives. “Spelman Professor Dismissed”. 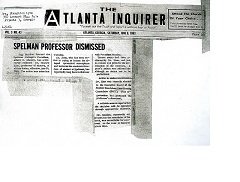 The Atlanta Inquirer 8 June 1963; Howard Zinn Papers: TAM 542: Box 3; Folder 22. Tamiment Library and Robert F. Wagner Labor Archives, New York University. Radical thinker, activist, historian, playwright, author, and teacher—these are just a few of the titles given to scholar Howard Zinn. Zinn, who dedicated his life and his work to radical justice and equality, will be the subject of a conference presented by the Frederic Ewen Academic Freedom Center at New York University’s Tamiment Library. The Tamiment Library and Robert F. Wagner Labor Archives are home to the papers which hold upwards of eighty boxes of archival materials containing speeches, letters, articles, recordings, and video of the late Howard Zinn. Brooklyn native Zinn completed his studies at NYU (B.A. ‘51) and Columbia University (M.A. 52’ Ph.D. ‘58) before undertaking a post-doctoral fellowship at Harvard University (‘60-’61). After a three year position at Upsala College in New Jersey, Zinn went on to become Chairman of History and the Social Sciences at Spelman College in 1956. Howard Zinn Papers: TAM 542: Box 3; Folder 23. Tamiment Library and Robert F. Wagner Labor Archives, New York University. While teaching at Spelman College in Atlanta from 1956 to 1963, Zinn had the opportunity to mold some of the brightest minds in the country. As a history professor, Zinn taught and became a mentor of Alice Walker and Marian Elizabeth Wright (now Marian Wright-Edelman). In addition to his teaching work, Zinn was extremely active in the Civil Rights movement as political activist. As a leader in the Student Nonviolent Coordinating Committee (SNCC) he advocated for freedom by participating in sit-ins and other political rallies, often with students from Spelman. As a result of Zinn’s radical political involvement, his tenure came to a premature end. 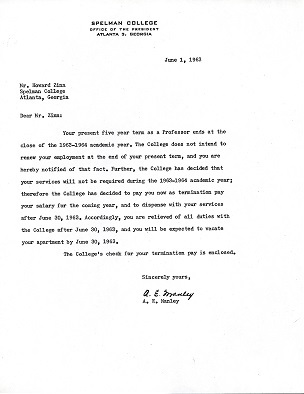 After seven years of service to the Spelman College community, Zinn was notified via a letter from Albert E. Manley, then President of Spelman College, that his services would no longer be needed, “…the College has decided that your services will not be required during the 1963-1964 academic year…” though he was still within the duration of his five year tenure contract with the college. 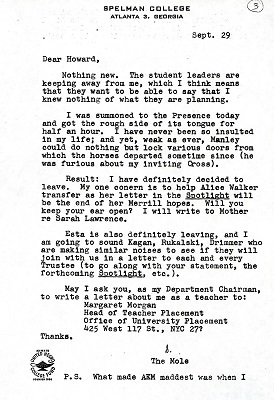 This notification was sent to Zinn on the same day he and his family were to leave for New York, where he would be teaching for the summer. An energetic student-led campaign ensued on his behalf to have him remain on campus. 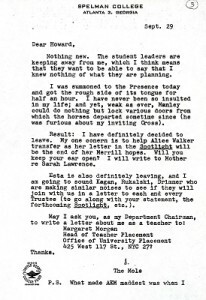 Many of his students wrote letters to college administration, and published articles speaking out against the administrative action in the school newspaper. 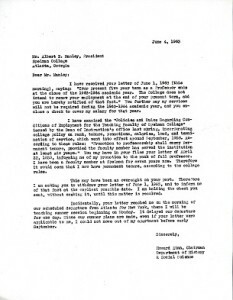 Correspondence between college officials and students regarding the incident can be found in the Tamiment. Howard Zinn Papers: TAM 542: Box 3; Folder 24. Tamiment Library and Robert F. Wagner Labor Archives, New York University. Howard Zinn Papers: TAM 542: Box 3; Folder 24. Tamiment Libraryand Robert F. Wagner Labor Archives, New York University. In an undated letter to the editor of the student paper, Alice Walker spoke out against the infraction by highlighting the multifaceted achievements of Zinn throughout his time at the college. Zinn’s controversial involvement in local Civil Rights politics agitated campus administration, leading to his dismissal. 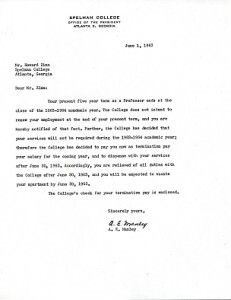 Although much of the correspondence within the Tamiment’s collection surrounds the timing of Zinn’s dismissal, there are no documents directly from college officials justifying the action. 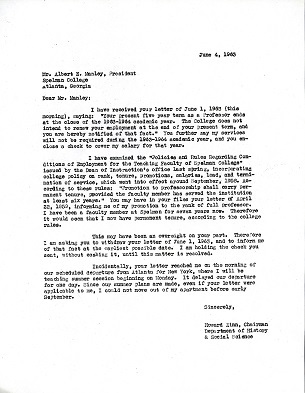 Spelman officials denied Zinn’s request as well as the request of his students for justification of the breach of contract. Unfortunately, student action on behalf of Zinn was unsuccessful and Zinn was relieved of his tenure track position and forced to leave the campus. Zinn maintained friendships with his mentees and some campus officials. In 2005, Zinn was invited back to Spelman College to deliver the commencement address to its graduating class. If only all communist agitators radicalizing our youth would lose their jobs. The future would be much brighter.